"A great book is one you keep at your bedside to pick up, turn to a page and always learn something inspiring. This is PI6! I especially like the guideline of never accepting frequent highs or lows or erratic readings. Just make adjustments!" "Pumping Insulin will measurably raise your diabetes IQ and lower your A1c. It distills extensive professional knowledge and personal experience of advanced diabetes care into bite-sized wisdom available no where else"
"This 6th edition provides updated tools for patients and professionals interested in insulin pump and CGM therapy. It is well organized and full of practical tips to help pump wearers and their diabetes care team achieve and maintain optimal blood glucose goals." John Walsh, PA, has provided clinical care to thousands of people with diabetes in various clinical settings. He is author of or coauthor of hundreds of diabetes articles and books, a thought leader in diabetes technology, and a popular presenter on diabetes topics to physicians, health professionals, pharmaceutical companies and people with diabetes. His various powerpoint presentations are available on our site. He consults and sits on the Advisory Board of several pharmaceutical companies. 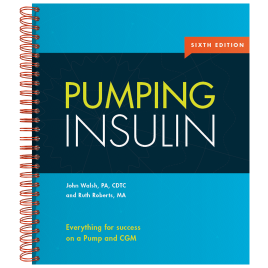 John also conducts research on how insulin pumps are used to assess the quality of diabetes education and the ease, convenience, and effectiveness of pump features as well as assessing continuous monitors and their effectiveness. He is considered an authority on intensive diabetes management. John also works at Advanced Metabolic Care + Research (AMCR). AMCR is recognized as one of the leading endocrinology centers in Southern California. Visit our Pump Comparison page or take a look at Each Pump .